Budhi Rikisyan sat in her house making leaf plates for the last rites of her granddaughter, Mantawa. Unable to suppress hunger pangs, the 12-year-old girl plucked surbari leaves from the field and ate them in early August. After five days she was suffering from acute dysentery. She convulsed a few times and then died. Surbari, a weed, is not poisonous but was infested with worms. "There was not a grain in the house. My son begged for rice but it was not enough for the five children," said Budhi, tears welling up in her eyes. Mantawa's father Nepali Rikisyan owns small land in Khachan village of Jharkhand's Daltonganj district. But drought destroyed his maize crop. He had put a fence of babul to prevent cattle from straying. But surbari did. The girl's death has created panic among the villagers.When they heard 25 kg of rice and 10 kg of wheat was being distributed for free, they rushed to the block office in Chainpur. But the relief was only for those with ration cards. "We do not have any such card," said Prabhu Korwa of the village. The administration denies any hunger death in the district. People say at least six have died for lack of food. 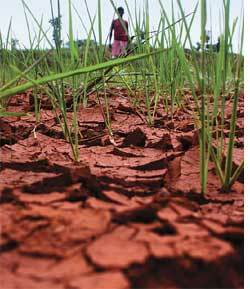 In Andhra Pradesh 25 farmers committed suicide due to drought by August 21, said chief minister Y S R Reddy. In Delhi at the state agriculture ministers' meeting on August 19, Union agriculture minister Sharad Pawar said the country had a good stock of foodgrain. He reminded the ministers that the government had procured 25.3 million tonnes of wheat and 32.6 million tonnes of rice in the last season. "Full allocations (of ration) for 65.2 million below-poverty-line and Antyodyaya families are being made to all states at 35 kg per family per month," he said. This foodgrain did not reach Mantawa in time. Some of it is rotting in open fields. The Food Corporation of India and the Punjab government have left more than eight million tonnes of wheat on rented fields, The Tribune reported on August 3. The plastic bags in which it is packed are drawing rodents. The total capacity of warehouses in the country is not more than 22 million tonnes, while 50 million tonnes of food crop are produced every year, said T Haque, former chairperson of the Commission for Agriculture Costs and Prices. Some of the grain slips through the corrupt public distribution system (pds). In Kannauj district of Uttar Pradesh people protested outside at the district magistrate's office on August 30, complaining they do not get sugar and wheat on ration card. "The pds contractor gives only kerosene oil," said Ram Asrey of Sharifapur village. "I have not received a grain of wheat this year but my card shows I have received everything." Additional district magistrate of Kannauj K P Singh said, "We know that the contractor is corrupt but the written evidence is in his favour." The government has raised msp (maximum selling price) for paddy to Rs 1,000 per 100 kg. This will not help farmers whose crops have failed. A long-term solution lies in selecting the crops carefully.